Philippines flag animations plus flag clipart and PNG images with transparent backgrounds. Philippines Flag button round PNG with transparent background and chrome frame. Philippines Flag clipart PNG with rounded corners, perspective shadow and transparent background. 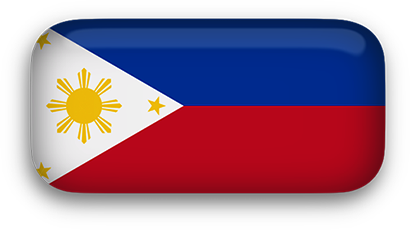 Philippines Flag button PNG with perspective shadows. Animated Philippines Flag GIF with transparent background. Filipino and English are official languages. There are eight major dialects - Tagalog, Cebuano, Ilocano, Hiligaynon or Ilonggo, Bicol, Waray, Pampango, and Pangasinan. The Philippine flag has two equal horizontal bands, blue on the top for peace and justice and red on the bottom representing courage. An equilateral triangle based on the hoist side ( white ) represents equality. In the center of the triangle is a yellow sun with eight rays, each representing one of the first eight provinces that sought independence from Spain. On each corner of the triangle is a small, yellow, five-pointed star representing the three major geographical divisions of the country: Luzon, Visayas, and Mindanao. The flag was designed in 1897. 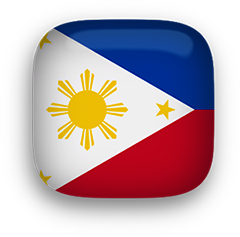 Philippines Flag clip art PNG square with rounded corners. Philippine Flag - 548 x 273 pixels - JPEG. Philippines Clipart, Animated Philippine Flag gifs.